Imbolc might not officially be until February 1, but sometimes busy witches have to fit their celebrations in around other things. I honoured the Goddess Brigit and first signs of spring yesterday and here is a photograph of my altar after the ritual was over. I would never take photographs actually during a ritual - that would be rather disruptive of the energy - but there's nothing wrong with taking a picture afterwards. 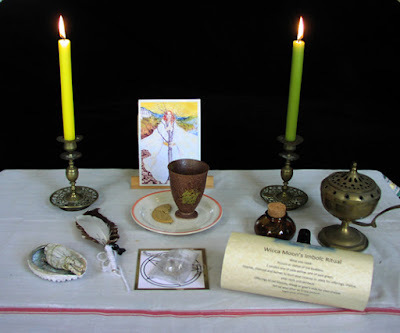 For my ritual I used one of Wicca Moon's Imbolc Ritual Boxes, which I was sent as a gift a few weeks ago. I'd really been looking forward to doing it and I have to say it was just as lovely as I hoped. The rite was slightly different from rituals I've created myself in the past and it is always good to try out new things.